The magic of Champagne lies is in its bubbles, which sparkle, dance and rise to the top. Peugeot Champagne glasses are born of this tradition of joy and celebration, synonymous with the French Art de Vivre. 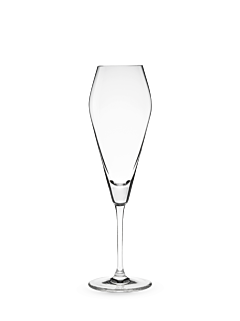 With their refined design, elegance and finesse, as a prelude to the nectar they are about to enhance, Peugeot Champagne flutes revisit the iconic shape of traditional flutes. 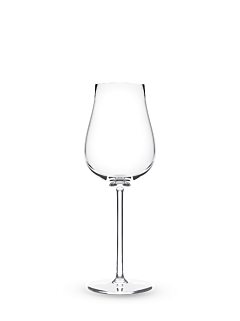 Always proudly perched on a fine and delicate stem that allows to grasp the glass without warming the Champagne, the Peugeot Champagne flutes take on the appearance of a diamond, widening at an angle at the centre of the classic rectilinear top of the bowl. In addition to the undeniable touch of originality, the angular shape of the bottom of the bowl, which ends with a conical peak and tightens at the rim, comes from deep wine expertise. Given that it is festive by definition, Champagne is nonetheless a fine wine which bubbles guide, along the walls, the aromas that express themselves and unfold their complexity before re-concentrating themselves as the glass tapers. Between tradition and modernity, Peugeot Champagne flutes are rooted in the aesthetics of a Champagne glass which, given its transparency, fades to make way for sparkling golden bubbles.